Your Indian wedding invitation forms up the first medium to tell your guests the celebration that waits on the “D-DAY”. What’s your wedding going to be like, what all they can expect and what do you expect from them, everything is communicated through this invite. It sets the perfect tone for your wedding ceremony, telling the guests what all they can “look forward to”. So whether you’re thinking of a destination wedding in any resort or fort, Or the beach wedding, or something minimal like a close family affair, plan your Indian wedding cards in accordance. In fact, we suggest you let your wedding cards portray more of “YOU” as a couple or your “STORY” obviously the “STORY OF YOU TWO” and not just the wedding. It’s not like if you don’t have a LOVE MARRIAGE, there is no story. How you first met? What makes you fall in love with each other? 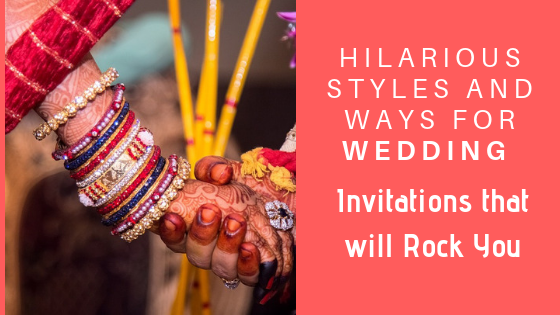 Any funny incidents or coincidences that you remember of, you can include the best of them in your Indian wedding invitations. For the couple going for “LOVE MARRIAGE”, you probably have a lot to share, your story, your journey, your little “FAIRYTALE”... You can include all of these in your INDIAN WEDDING CARDS, apart from listing the date time and venue of the wedding. As a born and brought up in India, “Raj and Simran” of Dilwale Dulhaniya Le Jayenge are our IDOLS of love. Every love quote or every romantic movie has one reference of it in either way. You are probably thinking, we were talking about Indian weddings, how RAJ and SIMRAN are a part of it. Well, the idea is that you can get a photo clicked likewise or get an artist to paint you like that and you can use the same for your INDIAN WEDDING INVITATIONS. You can even use the funny cartoon caricatures of both of you as the “ultimate couple”. Grooms don’t forget to mention the evergreen mantra, “DILWALE DULHANIYA LE JAYENGE”. Yes, the cartoon flair is still topping amongst the charts of funny and hilarious designs for Indian wedding cards. Now the question arises, which character can you use for portraying you? Some of the most popular power couples are “Tom and Jerry”, “Nobita and Shizuka” and some famed characters from comic series. How beautiful it would be to bring back the “childhood love” in reality in your wedding invitations. Other hilarious ideas can be “the superheroes”; they look lit and funny at the same time, doodles in your wedding invites and a lot more. The whole idea is to “think out of the box” and make your wedding invite more fun. These ideas are easy to incorporate and look alluring. Get in touch with the best designer of Indian wedding cards and know some more hilarious designs you can use for your Wedding Invitations. Let the recipient literally feel “LOL” or “ROFL” or “HAHAHA” after seeing the theme of your wedding invitations.